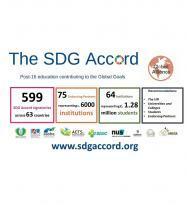 The SDG Accord currently has over 600 signatories, including 64 institutions representing 1.28 million students and nearly 100 global education sector networks representing 6000 institutions. A Global Alliance of the world’s universities, colleges and sustainability networks have today (Wednesday, 11th July) launched a new report; ‘Global universities, colleges and students leading delivery of the UN Sustainable Development Goals’. Presented at the UN High Level Political Forum in New York, the research calls on the UN to better promote the role of higher and further education in all of the SDGs rather than only Goal 4 and on senior management in universities and colleges to look for innovative ways to increase staff and student capacity to address the SDGs. This research was undertaken by the EAUC, on behalf of the Endorsing Partners, and you can find the report here and sign up to the SDG Accord here.